A guide on how to integrate wowroster (and more..) into the Joomla(mambo) CMS. Loot History module for Joomla ** REQUIRES ITEMSTATS MOD ** See Loot_history.php for info reg. 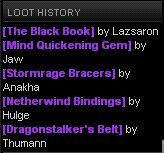 itemstats mod This module fetches the loots and looter from eqdkp! 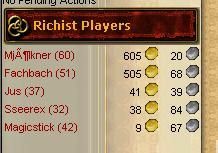 Exactly like the EQDKP Loot history module for joomla.. Just for the people who use NDKP (Nurfed dkp) Since i'm not using this system.. please check it out and report any errors..
Shows the 5 players with the most cash. Using Joomla's Module Feture you can intergrate all your tables together.